Today the Pittsburgh Marathon kicked off at 7:05am. At the start of the race, the temperature was hovering in the upper 50s with overcast skies. The weather remained pretty consistent throughout the race and the rain held off making for near perfect race conditions. Ten Wolf Creek Track Club (WCTC) runners participated in the day’s festivities, however, the standout performance of the day came from Nick Edinger. Edinger claimed 8th place overall in the marathon with a career best time of 2:18:32 (5:18/mile). Edinger’s time qualifies him for the 2020 USATF Olympic Trials in Atlanta. This is the first time in Edinger’s career that he has qualified for the Olympic Trials. Pittsburgh is widely regarded as one of the most challenging major city marathon courses among runners, making Edinger’s accomplishment even more impressive. Nick Edinger’s time also set a new WCTC record in the marathon. To put into perspective how impressive Edinger’s time is, he ran 8 minutes and 6 seconds faster than our winning relay team which consisted of four competitive runners. This race was Edinger’s 2nd marathon in 2018. His first was another outstanding performance at the NYC Armory Indoor Marathon World Record Challenge where he placed 2nd overall in 2:22:06. 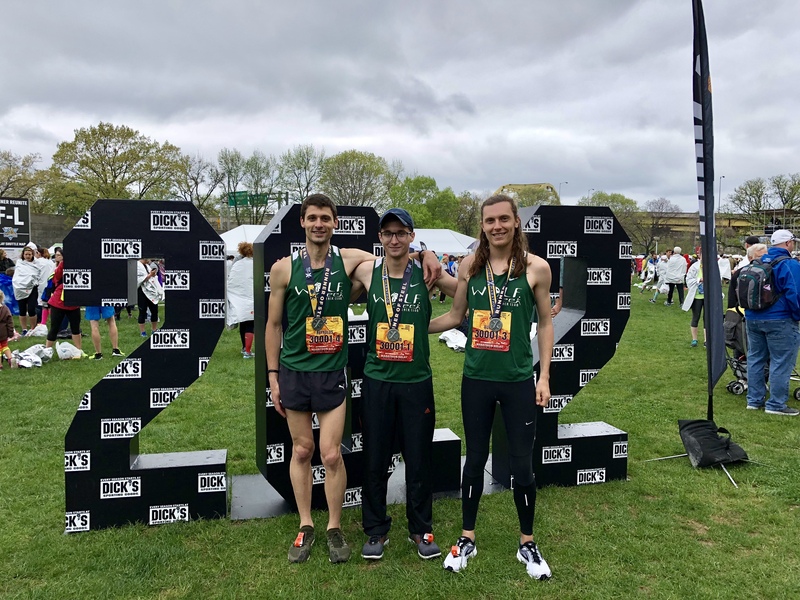 The Wolf Creek Track Club team consisting of Theo Reynolds, Ryan Budnik, Dan Spaulding, and Andrew Mascio claimed the Pittsburgh Marathon Relay title for the 2nd time in 3 years. The relay had to overcome an unexpected injury to Moses Greenspan in the days leading up to the race. Since Greenspan was unfortunately unable to run the lead-off leg as was originally planned, Theo Reynolds was forced to double, running the first two legs. Theo ran a total of 9.1 miles and posted a solid time to keep the team in it despite racing two runners from the other competitive relay teams since they had full relay teams of 5 members. When Reynolds handed off to Budnik at the second relay exchange zone, the team was in 3rd place trailing the 709ers and SuperSmashGang. Budnik was able to catch both of those teams during his leg and by the time he handed off to Dan Spaulding, the WCTC team was in first place by about 45 seconds. Dan Spaulding at the start of the 4th relay leg. 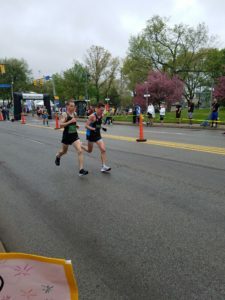 Spaulding, a former all-time great at Grove City College, extended the lead during his 6.5 mile leg and provided Andrew Mascio with a 69 second lead heading into the final 4.2 miles to the finish. Two miles into his leg, Mascio was challenged by the 709ers team. A runner from the 709ers had closed the 69 second gap in a mere two miles by taking advantage of the downhills on the final leg. Mascio and the 709ers runner ran side-by-side for the next 2 kilometers until Mascio was able to pull away in the last mile running 4:58 to seal the victory by 21 seconds over the 709ers. The 709ers runner averaged an impressive 5:10 per mile on his closing leg, while Mascio averaged 5:21 per mile. The WCTC team’s overall finishing time was 2:26:38 (5:36/mile). That time is a new club record for the marathon relay surpassing last year’s club record time of 2:28:45 by 2 minutes and 7 seconds, while doing so with only 4 runners. The 709ers finished in 2:26:59 (5:37/mile) good for 2nd overall, while the SuperSmashGang placed 3rd in a time of 2:39:07 (6:05/mile). In total, 965 teams competed in this year’s marathon relay. The relay victory marks the club’s 5th team title in its 3-year history. 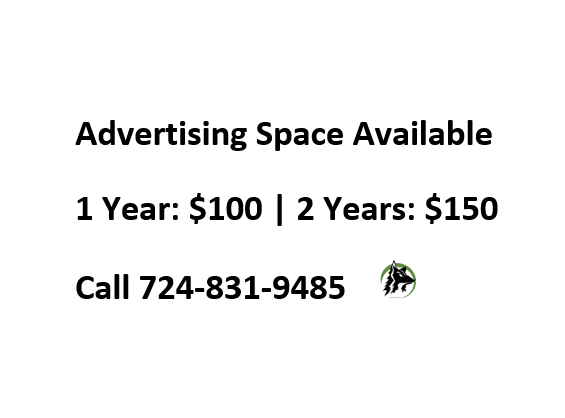 The other titles include the 2017 St. Barnabas 5k Team Challenge, 2016 USATF TRA Cross Country Championships, 2016 Pittsburgh Marathon Relay, and the 2016 St. Barnabas 5k Team Challenge. All-time, the club has won 5 of the 7 total team competitions it has raced in. Other great club performances on the day included Sean McDonnell placing 11th overall out of 12,500+ competitors in the non-elite half marathon field with a career best time of 1:16:03 (5:49/mile). 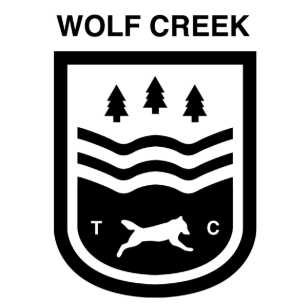 Sean’s time is good for second best in Wolf Creek Track Club history trailing only Theo Reynold’s time of 1:13:30 from the Cook Forest Half Marathon. Rachel Martin also ran the half in a career best time of 1:31:09. Martin’s time set a new club record for the half marathon and placed her as the 27th overall female finisher out of 7,400+. 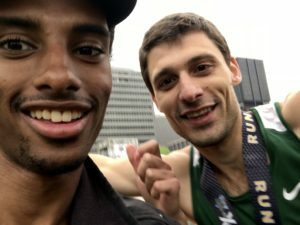 Additionally, club member Travis Myers-Arrigoni finished the marathon in 2:46:53 (6:23/mile) qualifying him for the 2019 Boston Marathon. Myers-Arrigoni finished 32nd overall. Club members Brandon Wise and Hannah Steele both competed in the half marathon as well. Wise finished in 50th place in 1:23:50, while Steele finished in a time of 1:45:23. Fikadu Girma Teferi claimed the men’s marathon crown in a time of 2:13:47, while Sydney Devore took the women’s title in 2:32:38. Chris Derrick claimed the USATF Half Marathon Championship crown in a time of 1:02:37 just edging out Parker Stinson who ran 1:02:38. Aliphine Tuliamuk claimed the women’s title in 1:10:04. 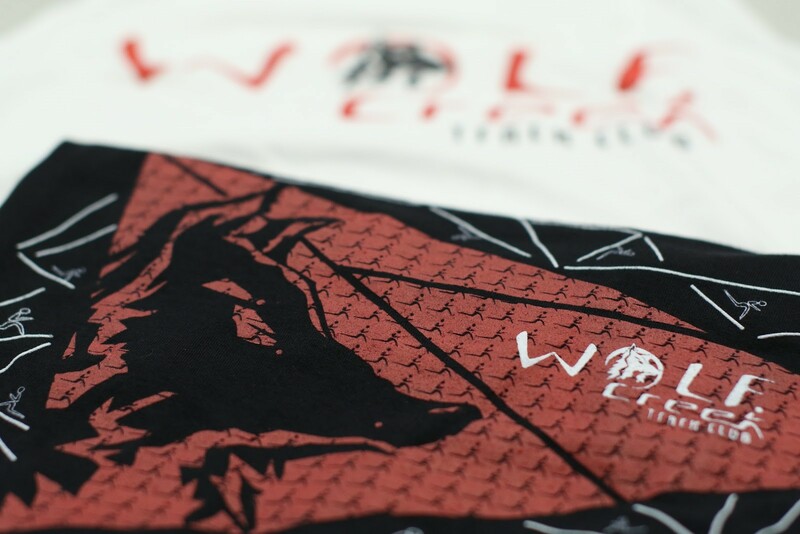 The Wolf Creek Track Club would also like to congratulate all the weekend warriors and first time half and full marathoners who ran at this year’s event. Running is truly one of the most unique sports in the world where the top elites toe the same start line as everyday runners. 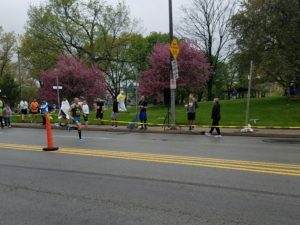 It was great to see another fantastic Pittsburgh Marathon to keep growing and promoting the sport of running in the region. The 11th Annual Pittsburgh Marathon is set for Sunday, May 5th of next year.